“House poor. We’re house poor,” the wife said sadly as she declined yet another invitation from her friends to go on vacation. This wasn’t what she had bargained for a year earlier when she and her husband had, starry-eyed, bought their dream home. It had been an exciting day. “A home is a great investment!” her friends, the TV, the agent had told her. But things turned soon after when she realized that the vaulted ceilings were causing the power bills to skyrocket, that the lawn upkeep was beyond their ability, and that the “little things” that needed fixing were not so little after all. She went to bed each night with a feeling of unease that the next day would turn up another hidden cost, and she and her husband both sighed when each new bill came in. She stopped thinking of the new house as her dream home and started dreaming instead of the cute rental they had before. Being house poor is terrible. But all too many of us know those people who got house fever, believing the lower cost of a monthly payment would be a better use of their money, and then ending up with so many hidden costs that they’re nearly drowning in bills. So when we hear of business owners who are told that a direct hire, at a lower hourly rate, is a better use of money, we feel like we have to speak up. Hidden costs don’t stop at home ownership. They show up in hiring too. We went digging for some comparisons and wanted to share. Hidden costs can kill the dream of having a great staff just as easily as they can kill the dream of homeownership. 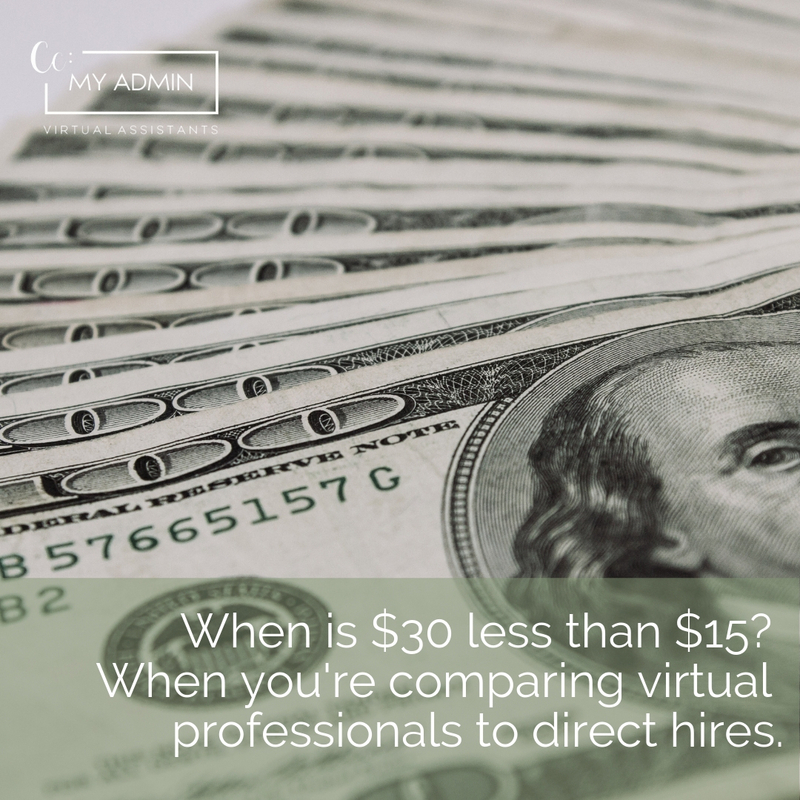 The simple math of $15 an hour for a direct-hire administrative professional versus $30 an hour for a virtual one makes the decision sound like a no-brainer. However, that is the simple version. And real-life is never simple, is it? There are other costs associated with hiring that business owners have to consider before committing to one route over the other. The simple math isn’t so simple when you think about things like overhead, fringe benefits, the expense of non-productive hours and retention costs. The graphic below explains it pretty well. But for a $15/hour employee, overhead will run you an estimated $16,354.80 per year–that would cover things like office space, equipment and the like. Fringe benefits like sick days, vacation, health insurance, dental and vision coverage, and retirement plans will eat up another $11,648.00. Retention costs are a real thing too, averaging $1,436.00 per year just to keep your employee with the company. And then, if we’re being honest about how people do office work then you’re looking at $7,800 a year for non-productive hours–that’s the nice way of saying that people spend a lot of time checking Facebook or playing Candy Crush at work. And all of that money is on top of the $23,400 you’re paying them for their work! All told? Your $15 an hour employee will cost you a total of $60,638.80. Meanwhile, the virtual professional will cost you $30 an hour, but that’s it. Over the course of the year, you’ll pay them $46,800 for full-time work–but that’s all you’re out. No overhead. No paying for sick or vacation time. No fringe benefits or retention costs. They’ll actually save you nearly $14,000 over the course of one year alone. What could your business do with an extra $14,000 PLUS an employee who is helping you grow your business by freeing up your time to bring in more money? There’s the simple math. 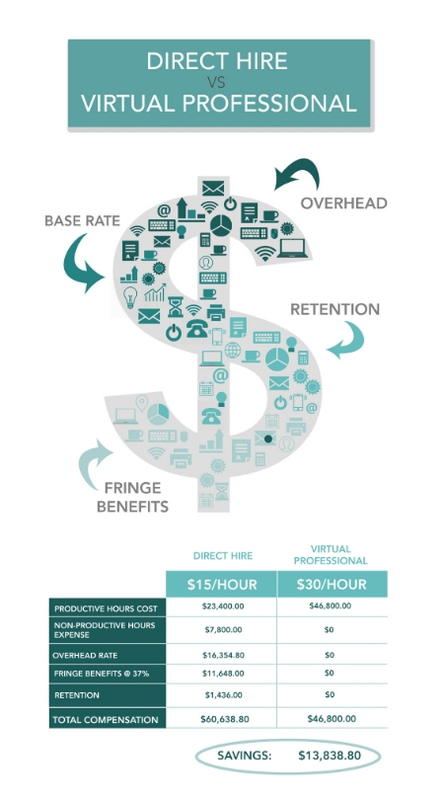 Knowledge is power, and we found this graphic to be enlightening about what the costs are when you are choosing between a direct hire and a virtual professional. Things are not always as simple as they seem. Hidden fees can stretch a business too thin just as fast as they sink the families who end up house poor because of them. Don’t let the appearance that you’re saving money sink your business, too.